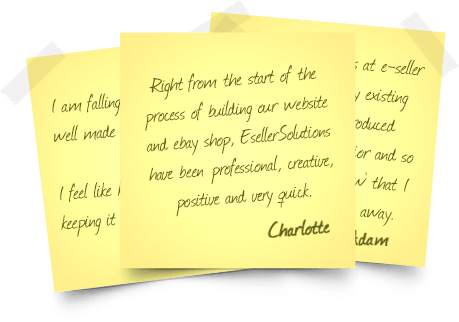 eSeller Solutions was created specifically to develop software and bespoke designs to help small and medium sized eBay retailers to compete effectively on eBay and online. We’ve helped businesses increase their online sales from 20% up to over 400%! Quite simply because we have been selling on eBay and online ourselves for more than a decade. We’ve spent endless hours listing products, fiddling with our shops and listings, trying to create an image that sets us apart from the competition, not to mention trying to create a professional appearance so the buyers don’t write us off as a dodgy backroom business. We had to find out the hard way how to use eBay, Amazon, Facebook, Twitter and websites to create a profitable company. That doesn’t mean that you have to do it the same way! After searching for ways to reduce the time we spent on simply administering our eBay shops and online listings, we finally gave up and created a partnership with developers to produce a cost-effective solutions tailored to the eBay, Amazon and online seller – no matter how big or small you are.